Gourmet Memoirs | My life's moments are gourmet memoirs created from a labor of love for food, family, and life. With only two months left until we get to meet our little guy, I started a list of dinners, breakfasts, and baked goods I could make and freeze to have on hand after his birth. One of our favorite muffins is a banana bran muffin using this recipe, subbing white whole wheat flour for the all-purpose, brown sugar for the regular, and adding 1/2 teaspoon ground cinnamon. I made two batches a few days ago that are now wrapped and stored in my freezer for a healthy snack or quick breakfast my first few weeks with baby Liam. One baked good I’ve had a constant craving for most of my pregnancy is Starbuck’s pumpkin scones, and this copycat recipe is very good, though I like adding 1 Tablespoon light corn syrup to the glazes. 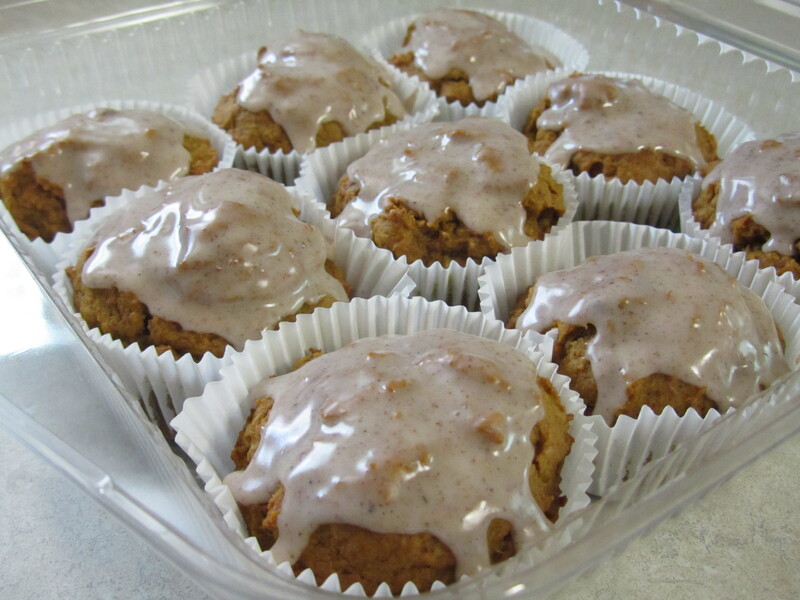 After making the banana muffins, I had the idea to combine that recipe with the scone recipe to make a thick but fluffy pumpkin bran muffin with a light spiced glaze. Either store in an airtight container in your refrigerator for up to one week, or freeze for later consumption. To freeze the muffins, place them unwrapped on the wire racks in your freezer until frozen through. Once frozen, wrap each muffin in plastic wrap (I use cheap sandwich baggies, smoothing the excess air out and then tying the top of the baggie into a knot) and place in a gallon-sized freezer bag. Individually wrapping the muffins before placing in the freezer bag provides an extra layer against freezer burn as well as any unpleasant freezer odors should there be any in your freezer over time. One gallon freezer bag should easily hold 12 muffins. Remember to label your freezer bag with the date and name of the food inside. To thaw, simply remove the number of muffins desired from the freezer, unwrap from the plastic, and set in an airtight container in the refrigerator overnight (to ensure the glaze doesn’t melt onto the plastic wrap.) Alternately, they can thaw on the counter top in a few hours’ time as well. You can place a frozen muffin into your or your child’s lunch box in the morning and it should be thawed by lunch for an easy, nutritious, yet still slightly sweet treat. If stored properly, the muffins should last up to 3 months in the freezer. The batter is very thick but fluffy. Using a cookie scoop (mine is the capacity of 2 Tablespoons) is the easiest way to scoop the batter into the paper liners. The batter will not spread and bake up pretty; it stays in whatever form it’s in when put into the oven. While they may come out of the oven not looking as pretty as other muffins, the inside is very moist, thick, and fluffy. Top with the light spiced glaze, and you can’t tell they were the ugly ducklings of the muffin world. I’m trying out a new routine for three reasons. Three: hubby and I are lucky enough to both work at home every day. The new routine? I am making lunch our big meal of the day (dinner, as my grandparents called it). I can use the oven or stove top as needed before the temps outside rise to the unbearable heat of the afternoon, and the cleanup after the big meal is done early in the day. We’ll have our lighter meal in the evening (what my grandparents called supper), consisting of big leafy salads filled with chopped veggies, hummus with pita bread and veggies, sandwiches, and anything else easy, fresh, and not requiring any heat preparation. 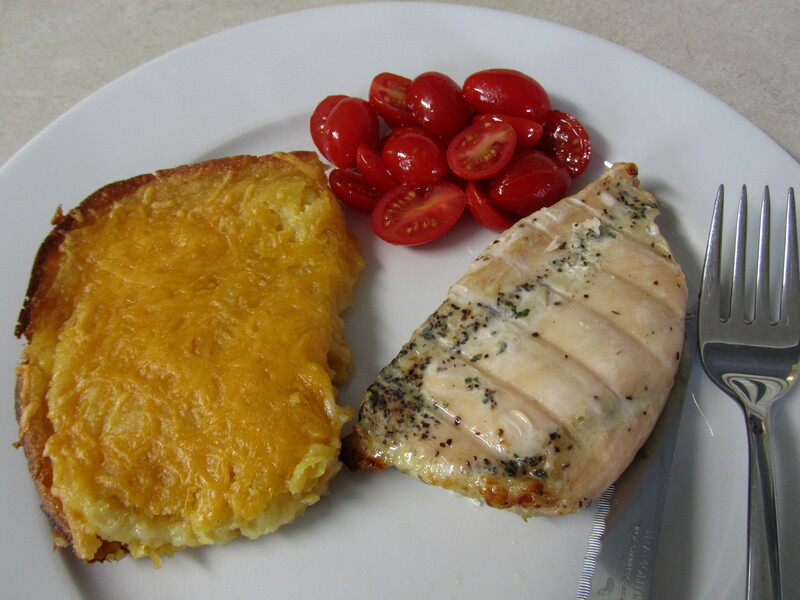 Today’s big noon-time meal was baked lemon pepper chicken (pre-seasoned and put in the oven straight from the freezer), fresh cherub tomatoes cut in half, seasoned with a tad of salt and drizzled with a good quality extra-virgin olive oil, and freshly baked corn casserole. I don’t know why I’ve never made corn casserole before. It was so creamy, gooey, and pure sweet deliciousness. I am giddy to have leftovers for tomorrow’s lunch, and that’s saying something since I haven’t been able to stomach leftover anything since being pregnant. All-in-all, today’s meal was a complete winner. Dessert was a nice helping of fresh cantaloupe and strawberries to finish the meal. I tried to lighten the recipe just a tad while maintaining the flavor, which is why I used nonfat Greek yogurt for half of the sour cream in the original recipe, as well as using half the butter, subbing in Smart Balance butter for the rest. I also didn’t put a ton of cheese on top – just enough to lightly cover the casserole. Trust me, there was no sacrifice in the flavor! It was so bright and fresh, gooey and delicious. The cheese didn’t overpower the rest of the dish in any way (because I hate it when cheese smothers the rest of the flavors). It was a perfect balance of flavors in an easy side dish to go along with the rest of the meal. And, in other news…we found out we’re having a boy! I’m so excited! With two stepdaughters, having a boy makes this experience a first for hubby, which is awesome. His name is Liam Edgar. I can’t wait to see his little face and hands and feet in about 18 weeks. There’s a reason I haven’t been sharing many new recipes or foods on the blog lately. Truth be told, I have lost interest in most foods the last few months. As my doctor said, “there’s definitely a baby in there!” We’re having a baby (!) and… I’ve pretty much quit cooking. Turns out, as exciting as pregnancy is, the first trimester food aversions have turned my food life upside down. Thankfully the food aversions are starting to go away with the close of my first trimester, because I’m still dreaming about the barbacoa taco I had at Torchy’s Tacos last week, and the better-than-grandma’s food at The Goodnight Diner in Wimberley, where we split pierogies filled with pork and topped with a paprika mayonnaise, followed by the most delicious dinner of chicken fried steak, bacon-braised turnip greens, and mashed potatoes. If you are ever in Central Texas, go to The Goodnight Diner in Wimberley. It is comfort food amped to a whole new level of delicious. I finally own matching dishware for a service for 12! I was ecstatic the day I brought them home. Hubby, however, just wanted dinner because it was late by the time I brought the new dishes home. I threw dinner together while I washed a couple of my new salad plates to serve it on. The dinner was incredibly tasty for something so quick and easy. So much so, that I’ll definitely be making it again sometime when we have the kids. They’ll love the pasta and veggies, and they’re always asking when we’ll be having salmon again because it’s one of their favorite foods. Besides, when “my stepmom’s good food” makes one of your kids’ required “things I like” lists for school, how can you not make them what they like? I have rosemary and pink peppercorn infused olive oil my cousin made for Christmas that I love to use on salmon. I think it adds the perfect hint of spiciness and flavor. 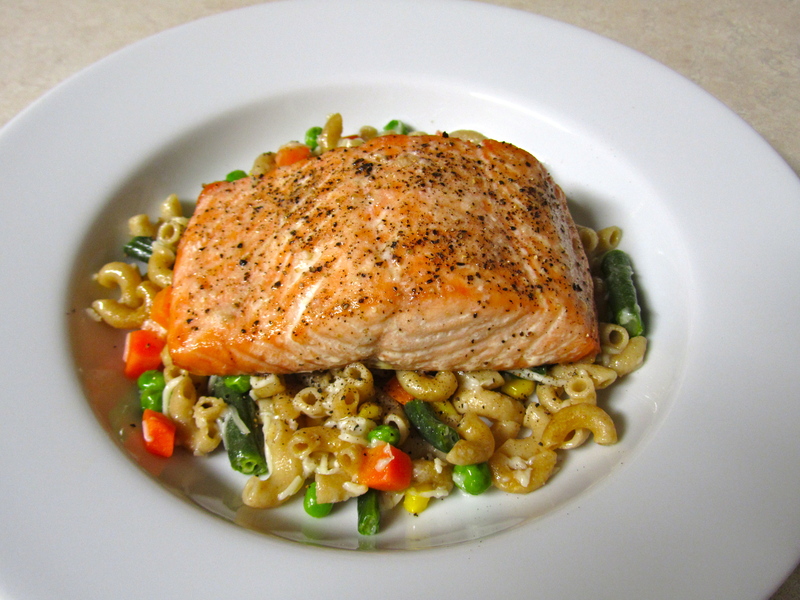 When salmon is done baking and easily flakes with a fork, take a metal spatula and carefully remove the steak from the skin and place on top of the pasta with vegetables. I don’t grease the foil specifically so the skin sticks to the foil and the salmon steak slides right off the skin. The measurements for the pasta and veggies are an estimate. I had leftovers of already cooked macaroni in my refrigerator that I simply warmed up with some frozen vegetables in the microwave. This meal is incredibly easy and fast to put together. The Parmesan is a must with the pasta and veggies, really adding a punch of flavor. Be sure not to under-season the salmon before baking. You need that seasoning to enhance the flavor of the fish. There’s a barbecue place in Central Texas that has this tasty little creation that every once in a while, I just have to have. Fuschak’s takes a tortilla, loads it with refried beans, brisket, barbecue sauce, hot sauce, cheese, and onions, and wraps it all up, creating the most delicious burrito, what they call a bar-burrito. When my hubby insisted we serve barbecue at our wedding because “otherwise it wouldn’t be a real Texas wedding,” I insisted we hire Fuschak’s to cater just so I could order myself a bar-burrito. They kindly delivered a handful of their delicious bar-burritos for hubby, my stepsister, and me. The only problem about getting a bar-burrito craving is that I’m not about to hop onto IH35 and spend up to two hours in death-trap-like traffic just to get one. The only solution is to make our own version at home. And on Friday evening, that’s just what I did – except I switched the brisket for chicken and the white flour tortillas for whole wheat. You can use a can of refried beans, or you can use my method below for smashed pinto beans. I prefer the smashed pinto beans because canned refried beans are too dry and thick for my liking. If you make your own homemade beans, that would be absolutely perfect. Using a potato masher, mash the beans into the liquid until they are all smashed, resulting in a creamy, slightly thick consistency. Cook over low heat until just heated through, cover to keep warm and turn off heat so as not to burn. While chicken and beans are cooking, finely chop half a small onion and set aside. Also set aside 1/2 cup barbecue sauce of your choice and 2 Tablespoons hot sauce of your choice, such as Tobasco. When chicken is cooked through, turn off heat and shred the chicken using two forks. I shred it in the skillet. Stir the chicken into the sauce remaining in the skillet, adding more if necessary to coat chicken, and heat through. Heat 6 7-inch whole wheat flour tortillas by either wrapping in damp paper towels and steaming in the microwave until hot (30 seconds – 1 minute) or warming for 15-30 seconds per side in a dry skillet over medium heat. I’ll be honest – I forgot to put the hot sauce on mine and I was missing it. It adds that perfect kick to enhance all the flavors. 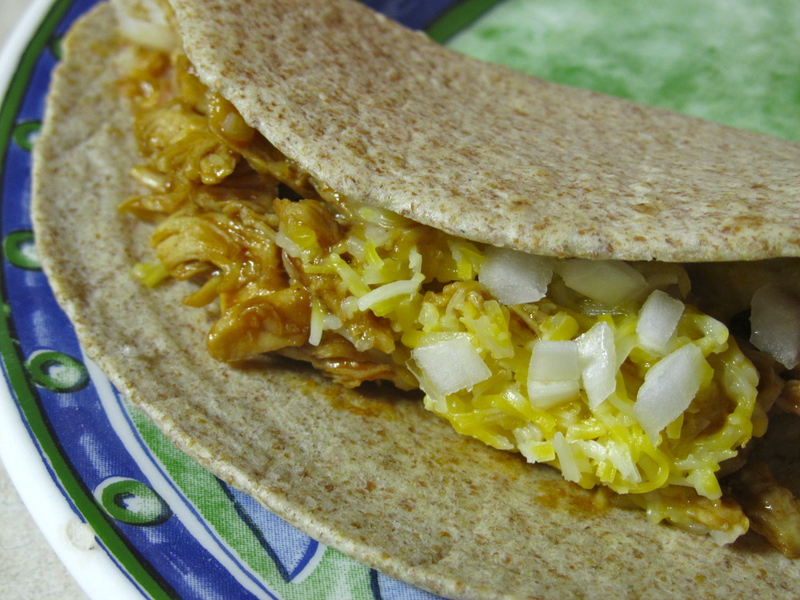 They were not the Fuschak’s bar-burrito (chicken is not a replacement for slow cooked brisket!). But they were still really good – good enough to fulfill the craving. I’ll definitely be making them again, especially when I can talk hubby into firing up the charcoal grill to grill the chicken. The next day the girls wanted grilled cheese sandwiches for lunch. I sliced some smoked cheddar, buttered some bread, used the leftover barbecue chicken, and made a tasty take on grilled cheese that was a hit with the kids. Are there any restaurant specialties you like to recreate at home? I’m always trying to recreate different dishes I had at restaurants, especially since we drastically scaled back how often we eat out, venturing to a restaurant only twice a month now. I used to bake a dessert nearly every week, but I’ve grown tired of cupcakes, pies, brownies, cookies, and the like. I’ve always considered my family’s diet healthier than most, and we’ve continued that trend into 2012, modifying it a bit by cutting back on baked treats. 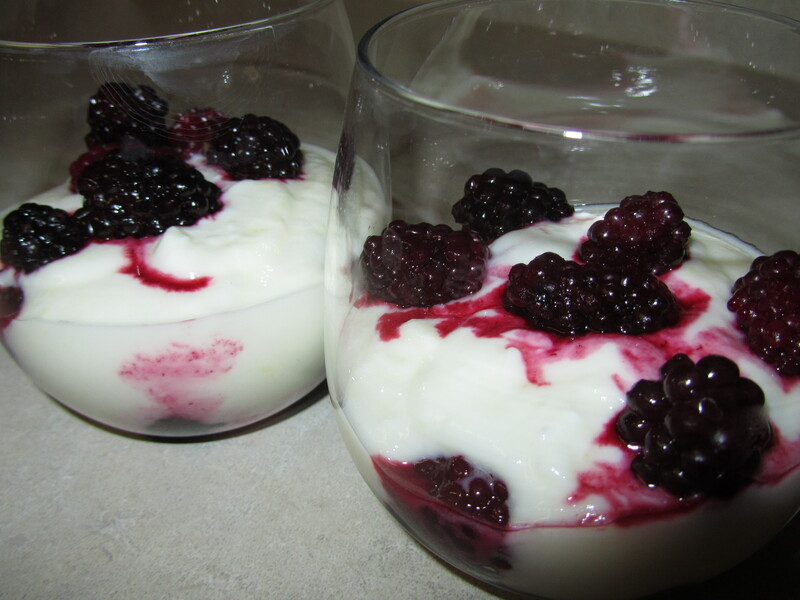 My alternative, and our family’s new favorite dessert, is lemon cream with blackberries. It’s so lemony, perfectly sweet, and made with only four ingredients. It’s quick to throw together, easy to adjust, and can be made with whatever berries you prefer. It’s a lighter dessert that satisfies the sweet tooth without making you feel heavy or guilty. These can be made ahead of time and chilled in the refrigerator until ready to eat, or you can serve them immediately. While I haven’t been blogging much (a two-month hiatus! ), follow me on Pinterest to see all the recipes I’ve been collecting from around the web and the ones I’ve tried! Are you eating healthier foods in 2012? We’ve added legume night to our weekly menu. Last week I made these vegetarian “Snobby Joes” recipe from The Post Punk Kitchen and they were awesome served on steamed, buttered whole wheat hamburger buns. Any new favorite health websites or blogs in 2012? I have been enjoying the posts by Heather Morgan at her Muffin Top Makeover blog. She’s hosting a virtual Healthy Living Book Club with a different book each month in 2012. Check it out! Thank you for everyone’s support and prayers for my baby great nephew! His surgery was successful! He is still in the hospital, in recovery, but his sweet mom finally got to hold him a couple of days after the surgery and he has an amazing team of nurses, doctors, and specialists looking after him. I am going to discuss a practice this week that I rarely take part in: Freezer Meals. Even when I had a busier schedule, I only made freezer meals a couple times a year. But for many families, they are very helpful, and on occasion I find myself wishing I froze more meals in advance, for days when I’m too tired or sick to deal with the prep work of a meal, or days when our schedule is just plain hectic. I love having a freezer meal option on days when we tackle big house projects, like painting. All the energy spent on home improvement zaps any desire to stand in the kitchen and cook! 8 cups of chicken broth, divided into portions. That’s seven meals ready to go, plus a full 8 cups of chicken broth to have on hand for soups, stews, casseroles, and so on. I also restocked the cheeses in my freezer. I buy shredded cheeses in bulk for a lower unit cost, divide them into 1-cup portions, and freeze them. I always keep monterey jack, colby jack, cheddar, and mozzarella on hand for casseroles, enchiladas, tacos, quesadillas, lasagna, etc. Freeze portions in individual freezer & microwave safe dishes, topped with foil, then tight-fitting lid. To reheat in the microwave straight from freezer, remove foil, vent lid, and thaw using the microwave’s defrost setting. Once stew and container have gently defrosted enough, microwave at 50% power for 2 – 4 minutes, stir stew, then microwave at full power an additional 1 – 2 minutes until thoroughly hot. Let sit for a minute, stir, then serve. Freeze portions in individual sized freezer plastic bags. To reheat in the microwave, tear the bag away from the frozen stew, place frozen stew in microwave safe dish and follow above instructions. To thaw on the stovetop, tear bag away from frozen stew, place frozen stew in a saucepan, and heat over medium low heat until thawed. Increase heat to medium and simmer for about 5 minutes until stew is heated through and steaming hot. Freeze one batch of stew in a large freezer safe container. To reheat, place container in refrigerator 24 hours before you want to serve the stew (the night before serving). Pour thawed stew into stock pot and reheat over medium heat, simmering at least 5 minutes, until heated through and steaming hot. When putting a dish straight from the freezer to the microwave, I ALWAYS use the microwave’s defrost setting to thaw the dish and food gently. Many dishes will crack or even explode if exposed to extreme temperature changes so ALWAYS be careful. Divide into desired freezer-safe containers, label with date, name of meal, and reheating instructions, and freeze. 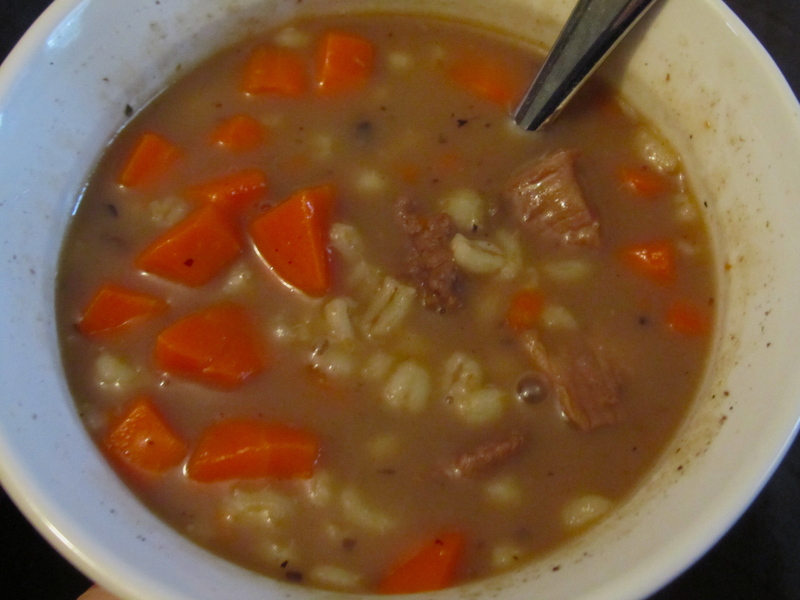 This is one of my all time favorite stews for fall and winter. It’s so rich and hearty with very few ingredients. It freezes and reheats well, so it’s easy to double a batch and freeze half for later. I have been known to freeze portions of stews in individual microwave safe containers, take them to work, and heat them for lunch. They make an easy and filling homemade lunch at the office. Remember to always, always ensure your dishes are microwave and freezer safe, and never subject them to sudden, extreme temperature changes for your safety. Exploding dishes are very dangerous. Also be sure to reheat food thoroughly, to steaming hot, to avoid food-bourn illnesses. Never freeze partially cooked meat. Freeze it raw, or fully cooked, never partially cooked. When in doubt, consult the United States Department of Agriculture Food Safety and Inspection Service’s website on Freezing and Food Safety.